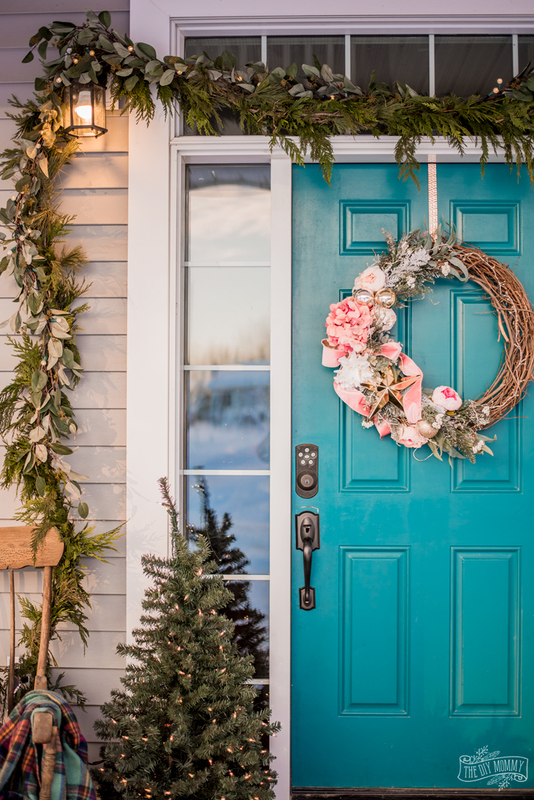 Come take a tour of our front porch decorated in pinks, teal and greenery, plus see more beautiful holiday home tours from my blogging friends! 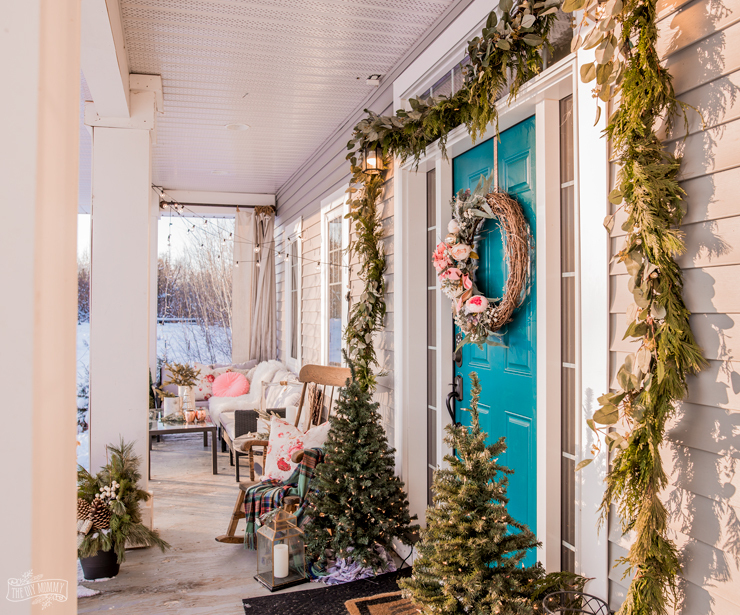 We just got a huge dump of snow last weekend, so that got me in the mood to decorate our front porch for Christmas! 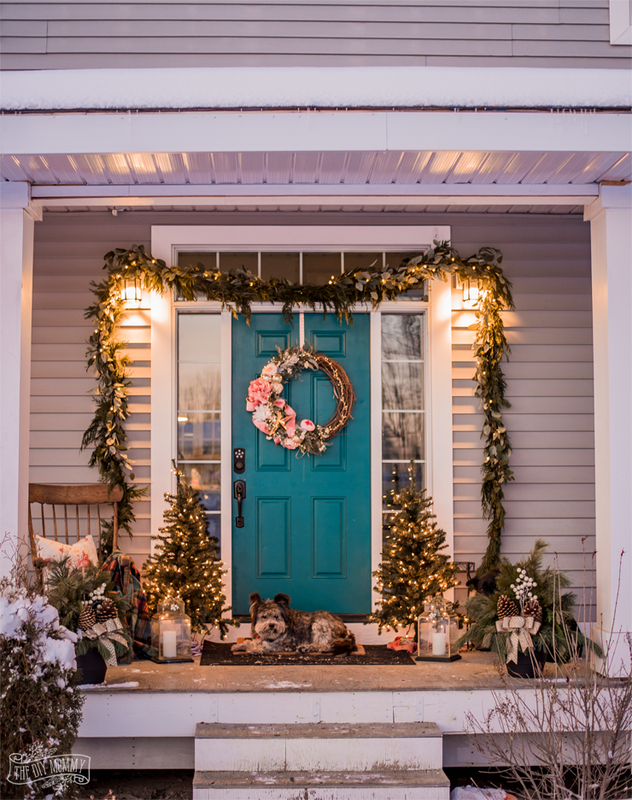 Let me show you what I’ve done this year (it’s not as traditional as last year’s front porch decor, but I still love it! 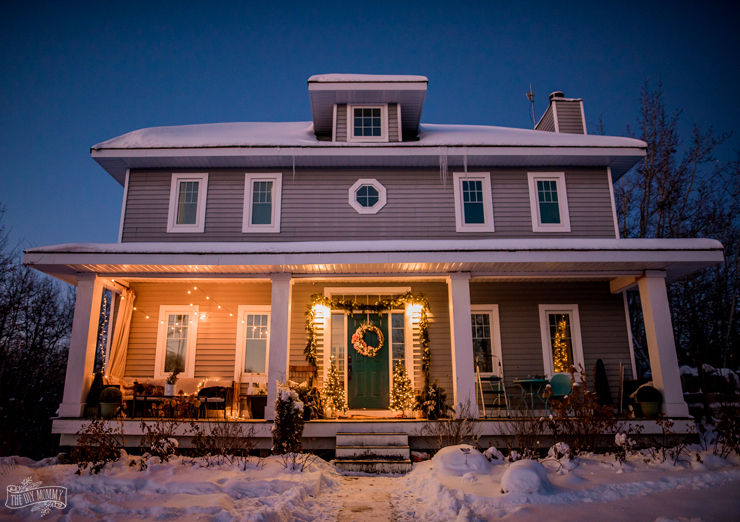 ), and then make sure to check out all of the other lovely holiday home tours happening this week at the bottom of this post. If you’re coming from Sawdust 2 Stitches, welcome to my blog! 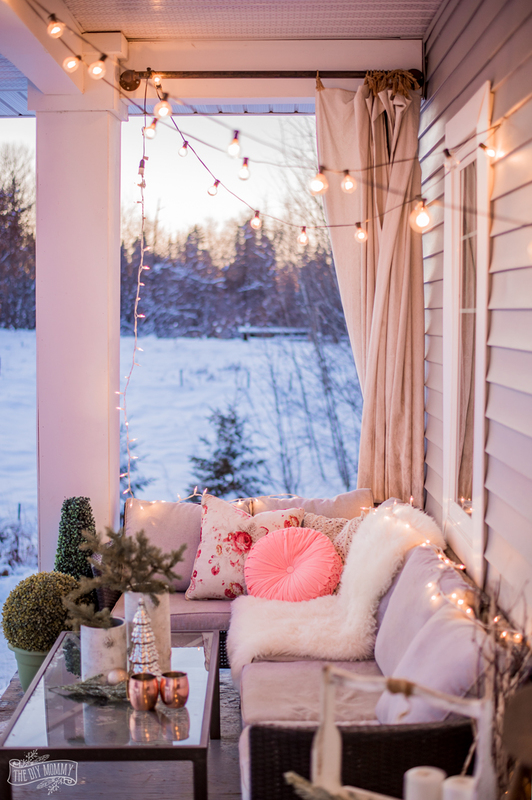 I hope you’ll enjoy my DIY and decor ideas and stick around for more. 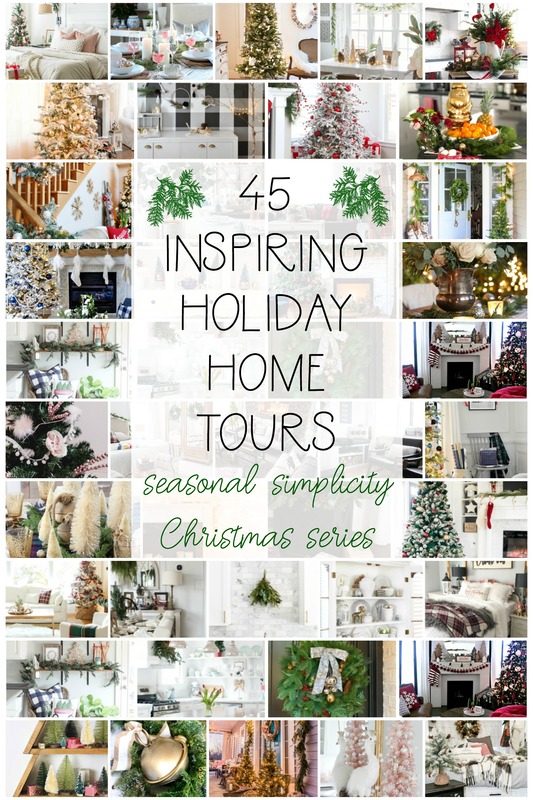 This tour is part of the Seasonal Simplicity home tour hop this week hosted by The Happy Housie, and I can’t wait to check out all of the other Christmas decor inspiration! 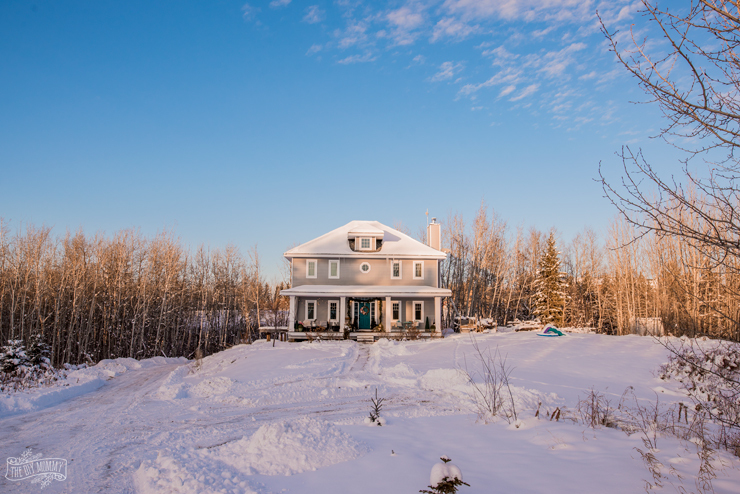 After you’ve seen my tour, Summer Adams is next on the list and I’m sure you’ll love her beautiful home. 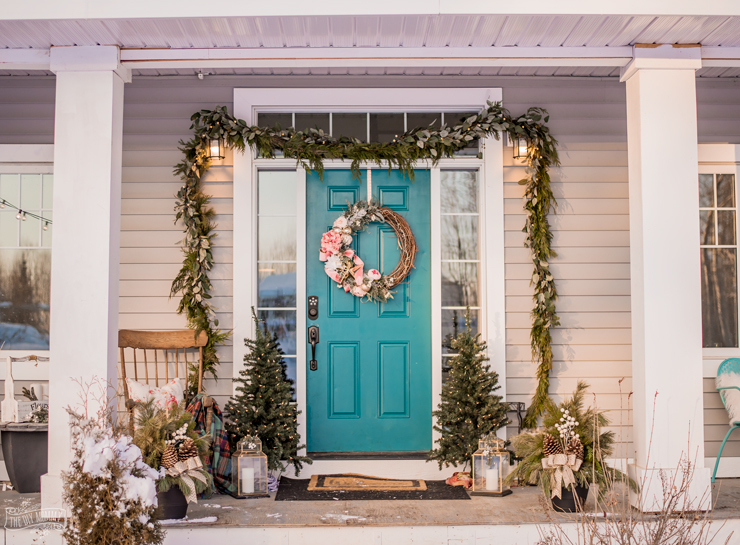 This year’s front porch Christmas decor scheme started out with this DIY wreath. 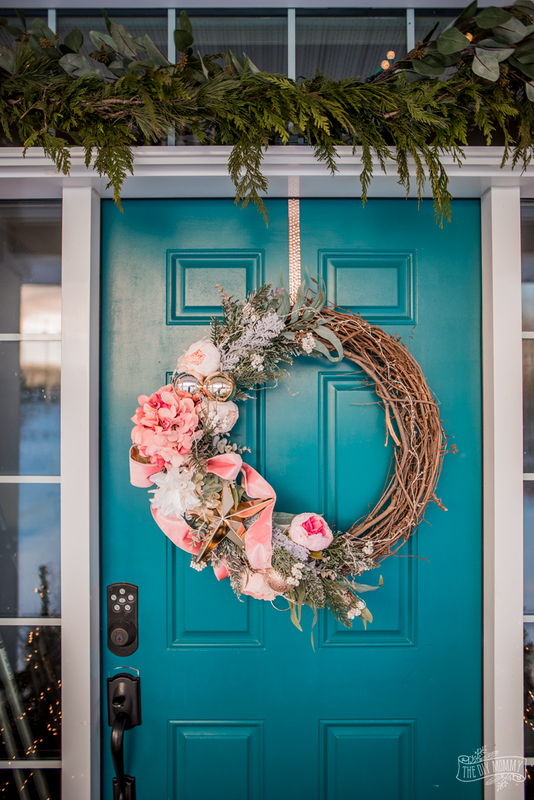 All I did was take the grapevine wreath I made in the Fall, removed the Fall-ish things (the Fall leaves & pumpkins), and added some Christmas things (faux evergreen picks, gold ball ornaments, a gold star tree-topper and some pink velvet ribbon). You can see the full DIY in the video at the bottom of this post. Next, I had bought another live greenery garland from Costco this year, so I simply draped it over the light fixtures on either side of our door. To give it a bit of oomph, I added a couple of faux eucalyptus garlands over top of the live garland and secured them together with twine. The eucalyptus garland is from Canadian Tire, and I love that it’s lit with battery operated lights! On either side of the door, I added some faux pre-lit Christmas trees, and wrapped their bases with old scarves. I also put some gold lanterns by the trees with some faux candles inside, and embellished them with simple faux greenery picks tied to their tops with floral wire. 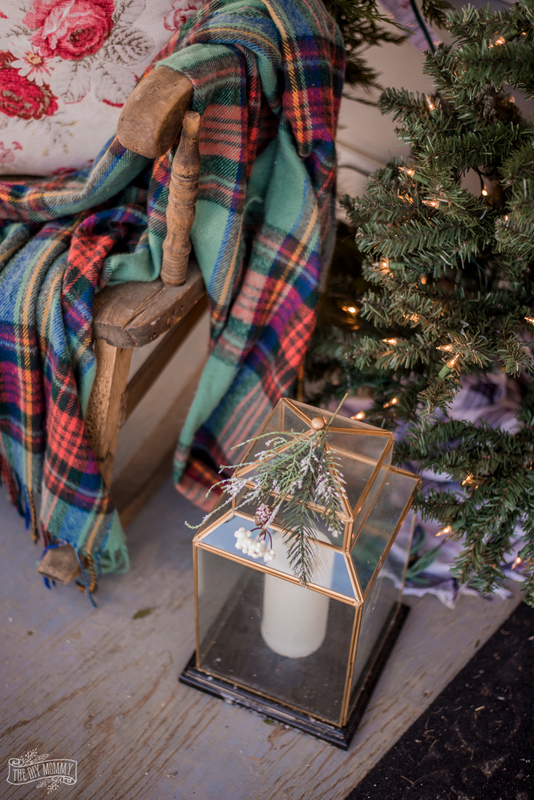 My great-Grandpa’s rocking chair got Christmas-ready with my favourite teal & red plaid scarf draped over it as a throw and a DIY floral pillow. I cheated a little this year and bought a couple of pre-made, neutral greenery urns from my local grocery store (Real Canadian Superstore). They were on sale, and I couldn’t pass up the price! 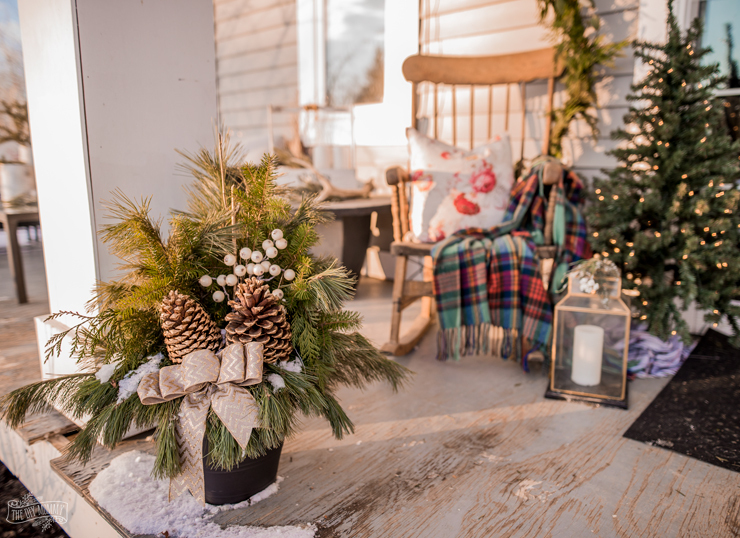 If you prefer a DIY version, you can find my easy outdoor Christmas planter tutorial here. 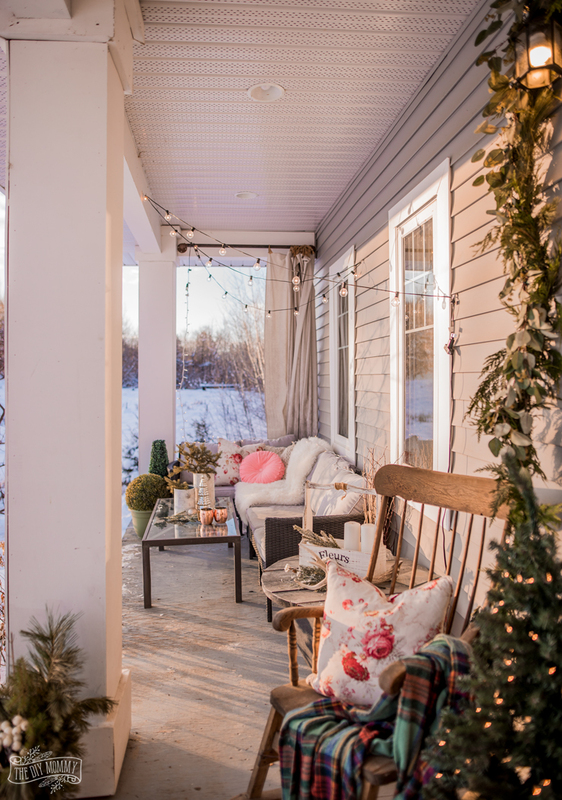 The dogs have truly made a mess of our porch sectional this year, but I don’t have the heart to take the cushions down for the season and shoo the dogs away. They’re both so old now, and even though they have a heated shop to sleep in, they love to spend time on the porch to watch the world go by. When the dogs aren’t claiming it, I put a sheepskin and some cozy pillows on our sectional for us to enjoy a little sit & a hot chocolate after sledding! 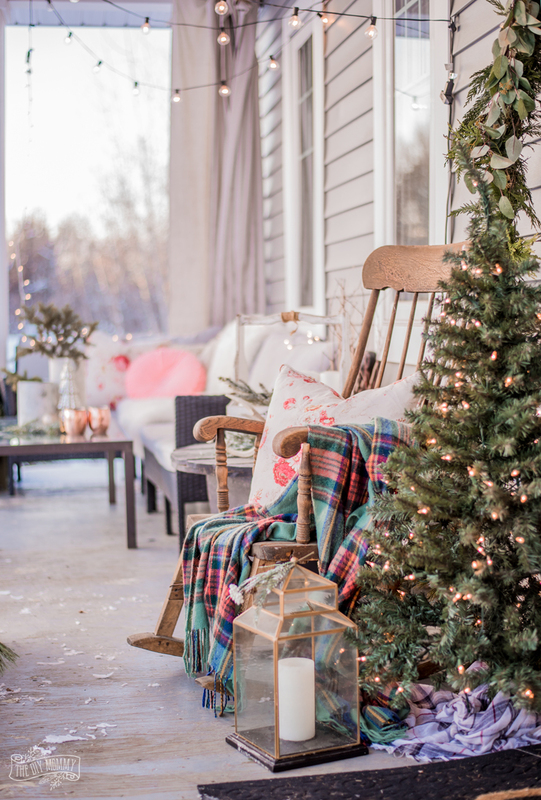 Twinkle lights everywhere and some real and faux greenery bits also help this side of the porch feel festive and cozy. 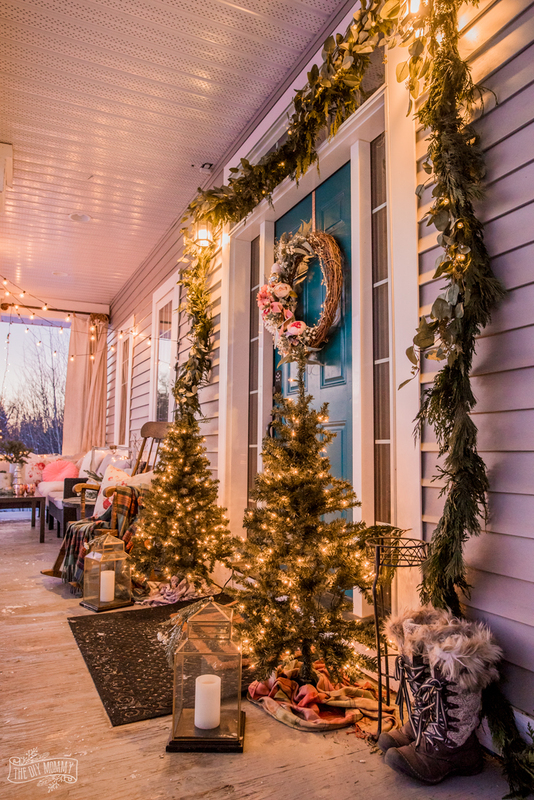 My favourite part of this year’s porch decor? The night-time view! I can’t get over how much I love all of the lights. It gets dark so early at this time of year (4pm?! ), so any extra twinkle we can get is much needed. So pretty and sparkly Christina! Thank you for sharing your porch with us on the home tour. Happy Holidays.